Until the early 1970s the wolf was ‘officially' considered as a pest in Spain, and the government paid out bounties for dead wolves and distributed strychnine to landowners and peasants. At the time, many saw the wolf as a mark of a Third World country, in contrast to ‘civilized' nations like France and Britain who had successfully eradicated their wolf plagues. On occasions in the past, persecution was widespread and crushing. An act passed by Principality of Asturias details that between March and December 1816, bounties were paid out for the death of 76 adult and 414 young wolves at 160 reales for an adult wolf and 32 for a wolf cub. The historian Juan Pablo Torrente concluded that the hunting of wild beasts, including wolves, bears and foxes represented, ‘in absolute and relative terms, a considerable source of wealth' for local populations. The lobero or wolf-hunter was a respected county figure until relatively recently, and a whole range of ingenious traps have been devised over the centuries to catch wolves. All are now illegal. It is however still legal to hunt wolves in most of Spain. In most of its range, the Law s states that the species must be respected as long as it does not come into conflict with human interests. While hunting itself does not necessarily pose a big threat for the Iberian wolf, as most hunts end in failure, the Law gives carte blanche for indiscriminate hunting in most areas. North of the River Duero, only the municipality of Muelas de los Caballeros in north of Zamora, where the densest Spanish wolf populations are found, has shown any real interest for its conservation. Protection is, however, much stronger south of the Duero where the Iberian wolf populations are far more fragile. Secondly, in the last 40 years there has been a huge migration of people from the country to the towns. This depopulation has led to the regeneration of natural vegetation in former agricultural areas and the huge increase in prey species such as roe deer and boar. Just drive or take a train across central and northern Spain and you will appreciate the immensity and emptiness of the landscape, and it potential to support rich and varied fauna. The Iberian wolf is considered by some specialists as a sub-species ( Canis lupus signatus) of Canis lupus, though this is rejected by many in the field. It is said to be distinguished by the black marks along its tail, back, jowls and front legs, and so sigantus meaning marked. More than 50 % are found in Northern Castilla y León (1000-1.500 individuals), and less than 35% in Galicia (500-700), with the densest population in North-eastern Zamora (5-7 wolves/100km2). Though wolves were once present throughout the Peninsula, they are now confined to the North-east (Asturias, Leon, Northern Castilla, Galicia), and a few residual populations in the Sierra Morena (Jaén and Cuenca). Recently, however they have managed to cross back over the modern-day barrier of the river Duero and begun to spread southwards and eastwards: two packs have been detected around Guadalajara and have started to move into Teruel in southern Aragon, much to the amazement and trepidation (and at first disbelief) of the locals. There are thought to be some 300 breeding pairs, giving a total number of around 1,500 at the start of spring and around 2,000 by mid autumn (1988 figures see below). The wolf in Spain is no longer considered endangered, merely vulnerable, though the Sierra Morena and Extremaduran populations are classified as critically endangered, and the latter is almost certainly extinct. Wolves in the Sierra Morena inhabit private game estates where they are illegally persecuted as they come into conflict with the hunting practices of the rich. Across the border in Portugal, there are reckoned to be between 46 and 62 packs. Wolves in Galicia Figure for 1988 may have been exagerrated. Article in June 2006 wildlife magazine Quercus (Special on Galicia) notes there are 60 packs (family groups) confirmed + 8 possible giving a figure closer to 350 wolves in Galicia. Wolves are present at a low density throughout the region except for the coast where they only found in Costa da Morte. As noted in this article, Galician wolves have long used rubbish heaps and remains from pig and poultry farms as a important food source. This is coming to end as EU regulations means they are increasingly fenced. On the upside the abandonment of rural life has led to a marked increase in roe and red deer since 1988. A major cause of death among wolves in Galicia is road kills (58 in the last three years). There is also undoubtedly a high hidden mortality from direct human persecution due to conflict with livestock, especially in more humanised areas where there is little wild prey. Over 2200 livestock deaths were reported between sept 2003-Aug 2004. Although Galicia is not a particularly densly populated region, much of the area is semi-urbansised in sprawling settlements. The possbilities of wolf-dog hybrids in such an area are therefore higher, though there are no studies on this. Another threat is fire, which has led to severe habitat degradation across much of the region. Oscillating population of 14-21 packs (by 2002). Severe conflict with livestock owners. Recolonisation of Western Picos de Europa. Estimated at some 300. May have been seriously affected by 2005 fires. Some packs may have moved into Spain. Strictly protected. In 1988, wolves were estimated to have killed some 1,200 horses and donkeys, 450 cows and 5,000 sheep and goats, representing a total loss of 720,000 euros. The figures are no doubt higher now, but over the wolf's full range (100,000 km2) these loses are tiny in comparison with other natural causes which regularly afflict farmers and herders (disease, inclement weather) but they can represent a serious problem for livestock raisers in certain local areas. 77% of livestock deaths occur in mountainous areas where extensive farming practices are prevalent. Indeed, with just 15% of the 2,000 Spanish wolves, the Cantabrian wolves cause 70% of the damage to livestock. Clearly it is not that the Cantabrian wolves are any more aggressive, but rather that they find easy pickings in the plentiful livestock which graze in semi-freedom here. Unfortunately, wolves like many carnivores frequently get so excited by the blood and slaughter that they kill far more numbers of a flock than they need. In Spanish these attacks are known as lobadas. One study in Burgos showed an average of 7.6 sheep killed for every lobada. As another great Spanish naturalist Miguel Delibes once said, ‘the wolf is its own worse enemy'. Whatever the case, the damage caused by wolves is often greatly exagerated. In the Sierra de la Culebra, with the highest wolf densities in the whole of the European Union, 80% of the attacks on flocks are only one sheep. Attacks on livestock are most frequent in areas where animals are not protected in pens or by mastin dogs or shpeherds at night. This is most noted to the south of the Duero where despite having very low densities 'wolves' are responsible for numerous attacks, particularly in the Sayago dehesas. The fact that livestock raising methods are less compatible with the wolf is unsuprisingly given its long absence. But a word of warning, the area is also frequented by feral dogs which cause even more damage than the wolf with 11.6 animals affected per attack. These are invariably blamed on wolves. In all surety, feral dogs cause far more damage than wild wolves to Spanish flocks and herds. One statistic should suffice: an estimated 87,000 (eighty-seven thousand) dogs were abandoned in 2003 in Spain. What do they eat? (see half-wolves below).Wolves also play an important role as 'top dog' in the food chain. The renewed stable presence of the wolf in the Cordillera Cantábrica provides a natural check on wild boar, which are expanding throughout Spain in ever greater numbers into just about every ecosystem. This check on the boar population may well be good news for the incredibly endangered capercaillie, whose Cantabrian population has plummeted in recent years. Boars, it seems. are partial to capercaillie eggs and chicks. See Wolves, boars and capercaillie. Wolf management is no easy task. They draw highly conflicting stances and beliefs, from an idealisation on the part of the urban population to the pragmatics of the rural populace. One of Spain's specialists on the species, Juan Carlos Blanco, noted; “what makes this conflict strange, what turns the management of the wolf into a nightmare, is the symbolic nature of the species, which unleashes hidden tensions in society and brings to the surface seething emotions which confer on the problem a high degree of irrationality.” The excessive wolf-friendliness of some urbanite ecologists does not exactly help to enamour the rural population with the wolf. And all too often the farmers' view is based on greed, ignorance and even hate as is evidenced week in week out in articles in the local press of wolf areas of Spain in which farmers, often goaded on by Partido Popular counsellors vastly inflate damage caused by the wolf. This reached surreal proportions in 2000 when Asturian sheep farmers put in compensation claims for more sheep killed by wolves than actually existed in the Principality. The solution undoubtedly is a mixed bag including: use of traditional mastiff dogs to protect flocks, bringing back the old practice of closing livestock in for the night instead of leaving them untethered in the mountain pastures –increasingly and understandably farmers work only part time with their livestock, and so their animals are left up in the hills alone-, allowing prey species such as roe deer and chamois to grow unchecked by hunting, promoting tolerance for the wolf through educational programmes, reducing tensions between the different parties, encouraging dialogue, and perhaps most importantly the swift and full payment of compensation by the authorities for livestock killed. Many years ago, there was a lass from Leon who could be seen wandering around the Caurel hills in the borderlands with El Bierzo. She had been cursed by her father and had gone mad. The girl, it seems, loved meat. She ate so much of it that one day her father lost his temper and bid her go to the mountains to live with the wolves where she could satiate herself with flesh to her heart's delight. The spell took a-hold and that very night the girl headed for the hills. After rolling about for some time on the forest floor, she turned into a she-wolf. Sometimes in the form of a wolf and others in the form of a woman, she slowly made her way to Galicia where in her wolf-form she became chieftain of a wolf tribe which caused great harm to livestock and people alike, although it is said that when she took on her human form she would build a bonfire and prevent her wolves from doing harm to anyone. Once, for example she is said to have stopped the wolves from attacking some Portuguese travellers who were smuggling salt. After many years, the spell was broken unintentionally by a miller. The wolf-woman would often sneak into his mill and eat the flour. One night though, the miller happened to be sleeping there and was awoken by a scuffling sound. It was the she-wolf trying to get in under the door. The miller grabbed his knife and drove it into the wolf's paw. There was a terrible howl and then a scream, and then the wolf hide fell away from the figure revealing a woman. At first, the girl did not know where she was. All the villagers were fascinated by her story and wanted to know where she was from. Finally, she returned to her land and was received in her home with much rejoicing. When the harvest came around, Galician reapers journeyed to the village from the lands where they had known her as a she-wolf. After conversing with them, she began to remember the places where, under her father's spell, she had committed all those fell deeds, and especially the handsome boy she had killed and greedily devoured in the depths of the forest. In Extremadura, Leon and Asturias the animal was often killed to ward of potentially evil events such as a llobadío –a wicked curse transmitted by the wolf's gaze. Clearly, behind all the mumbo-jumbo the real reason for the historical and hysterical hate of the wolf lies in the fact that man and wolf compete for the same resources; the proteins from game and livestock. Another tradition based on firmer ground is the existence of half-wolf, half-dog hybrids, particularly in the Asturian folklore tradition, in which tame wolves (known as lobos de jaulas – caged wolves) are released into the hills to unleash havoc A modern version of this has recently hit the news in Asturias where the government and livestock farmers have warned of the presence of such crossovers. Unusual behaviour has been detected among certain wolf individuals, which instead of fleeing at the sight of humans, stay and stare, albeit at a distance. They are reported to be attacking sheep and cows in broad daylight and close to villages. Many farmers are blaming the increase in attacks on livestock in some areas on these dog-wolves. Some experts claim that the hybrids have inherited the wolf's ferocity and the domestic dog's lack of fear of humans. The theory goes that a hybrid might have arisen through the mating of a lonely, old male wolf and a young female dog. The other way round would be impossible. As one expert put it, ‘the female wolf would have the male dog for breakfast'. The former coupling would raise hybrid pups which would then protect them from wolf attacks. They would then begin to form a pack and attract new adepts. The Asturian government claims to be in possession of a photo of one such coupling with its hybrid cubs, but strangely refuses to release it as ‘it is scientific material under study'. Unlike the farmers, the government believes dog-wolves are exceptional and isolated cases, though it currently is concentrating its wolf culling efforts on eradicating such crossovers. In contrast, the leading wildlife protection group FAPAS in the area is highly sceptical of the existence of the beast. They believe such a coupling to be impossible because a wolf will always kill a dog given half the chance. It also believes that feral dogs are not to blame either, as, unlike the rest of Spain, wolf country is virtually free of wild dogs: wolves just hunt them down and kill them. Instead they put the blame on domestic dogs: as Roberto Hartasánchez, the organisation's president, put it, “they go out at night and attack livestock. Then spend their days sleeping on the fireside rug at home. They are uncontrolled dogs, but they are not wild. In rural Asturias, most dogs are not fed at home. Where do you think they eat?... It's just easier to blame the wolf. On our random travels through Northern Spain and the Pyrenees in summer 2004 we found ourselves in the village of Gósol in the Sierra de Cadí in the Catalan Pre-Pyrenees. Gósol's main claim to fame is having accommodated a young Pablo Picasso in the summer of 1906, something it proudly exploits today with reproductions in the local museum of the few pieces he did while staying in the village, and a bronze sculpture of a woman which Picasso had painted in the village square. The village is also one of bases for climbing the myth-enshrouded twin-peaked mountain of Pedraforca , a bastion of the Catalan witching and mountaineering traditions. The landscape of black pine forests and limestone crags is rugged and spectacular. The day we arrived the headline in the local press was that a “starving” wolf had slaughtered several head of cattle in broad daylight. The wolf, a male, the first in Catalonia for more than 70 years, first hit the news in spring 2004. Contrary to many reports, the individual has NOT made its way all the way from Italy. However, tests confirm that it is genetically Italian in origin, forming part of an expansion over a number generations out from the Apennines. The Apennine population began to expand in several directions from the early 1990's. It moved north into the Italian and Swiss Alps; north-east into the French Alps and Lyon, and east towards the Pyrenees, reaching the Maritime Alps near Nice by 1996, Saboya by 1998. An individual was detected between Areja and French Cerdenya by August 1998 in the Madres Massif, just to the north of Canigó, and finally by 2004 into the Cadí range. Most locals appear to be ambivalent rather than hostile towards its presence. The last Catalan wolf was shot in Terra Alta in the south of the Principality in 1929 (1935? ), though the animal is thought to have disappeared from the Sierra de Cadí more than 100 years ago. To the south, there was also a case of a proven wolf presence in Morella in 1987, just across the border in Castellón , Valencia . This was no doubt a freak case, but wolves are slowly moving westwards from their Castilian strongholds. A pack is now established around Gallocanta in southern Aragon . Sooner or later packs of wolves are going to make their way along the Ebro corridor and into the mountains of southern Catalonia , and from here up the Cordilleras Costeras Catalanas…Another possible route in is along the Pyrenees . Wolves are now present in western Huesca. (updated and corrected from JM Landry's excellent El Lobo, in its Spanish adapted version by Albert Moró). They may be 2000-2500 Iberian wolves in Spain but if you want to see one in the wild, without expert help you're going to have to be persistent or lucky or both. 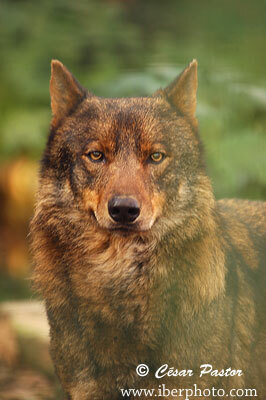 Spanish wolves have long learnt to be vary of humans and so actual sightings are rare. Proof of this lies in the fact that most wolf hunts organised legally or illegally end in total failure. The best chance is probably Northen Zamora, where the highest wolf densities are found. (Peralejo, near El Escorial, 48km from Madrid): tel. 91 890 6980 / 91 890 8748, fax 91 890 0451. Vado de los Fresnos. Candeleda (Ávila). Run by the same foundation as the nature park in Peralejo. The old presence of wolves is given away by many placenames throughout Spain and well beyond the wolf's present-day range. For example, Cantallops (wolf song) in Catalonia. Lobo is a common surname as is the Basque surname Otxoa written Ochoa in Castilian from Otsoa the Basque for wolf. !que viene el lobo! : danger! The lince ibérico (Iberian Lynx) is also known as a lobo cerval. de la situación del lobo. Enhorabuena. Sólo querríamos hacerte una puntualización respecto a la valoración de los daños ocasionados por el lobo. también a algunas que no existían). Esto es una anécdota para ilustrar la picaresca respecto a los daños, y un aviso respecto a cómo manejar con precaución los datos oficiales. c) El número de presas salvajes se reduce continuamente. c) El ganado es dejado suelto y sin vigilancia por los ganaderos, que han perdido el hábito de guardarlo, y que suelen ser ganaderos a tiempo parcial (trabajan en una fábrica durante la semana mientras su ganado es dejado en los montes y sólo es atendido durante los fines de semana). Sobre los muladares: también fueron retirados para las aves carroñeras tras el episodio de las Vacas Locas. meme "ganado es comida" redundaría a medio plazo en más ataques al ganado. su camada en condiciones muy difíciles. condiciones de vida vuelven a ser difíciles (p. ej. en el caso de bandas de perros cimarrones). En general, desde un punto de vista adaptativo se cumple la regla de que "la necesidad crea la función". Cuando desaparece la necesidad el ser vivo "olvida" la función por innecesaria. se suele dar cuando disminuyen las posibilidades de reproducción entre miembros de la misma especie. los casos de hibridación. Es difícil decir si eso ocurre en Asturias o es un invento. las leyes --algo muy frecuente entre las autoridades.